How Can Batman Stay An "Urban Legend" In A World of Surveillance? In a lot of versions of the Batman story, he's an "urban legend" — nobody has ever seen him or photographed him, and few even believe he exists. But could that even work, with surveillance cameras and cameraphones everywhere? In a discussion about today's "Morning Spoilers," Tonii said Batman as an urban legend only works if "Gotham is a place without a police surveillance system and CCTV... No wonder that city is so full of crime." Even if Gotham had police surveillance and CCTV, you don't think Batman would know where the cameras were? And/or be able to hack into the system to remove any footage that may show him? I'm sure the batcomputer would have a dedicated algorithm to do exactly that. I don't know where you're from, but here in NYC, there are several cameras on literally every block in Manhattan. The cops have them on the lamp posts and other hidden locations and private business all monitor their doors and blind spots. Some record a stream, others are monitored by a living person. I would think Gotham would be the same. I suppose in a fictional world, a guy like Bruce Wayne would know where every single one is and has a way of deactivating many hundreds of them each night... Or can spend the time collecting the images before someone sees them. But in the practical world...? Not to mention everyone out there with a smart phone. Maybe he's still only an urban legend after 30 years, because Wayne Enterprises R&D was able to come up with a MIB style neutralizer. He just "flashy thingys" anyone who sees him. Batman as an Urban Legend ... do young criminals dare their punk friends to look in a mirror and say Batman's name five times? Yeah... this isn't the practical world, though, it's a comic book world with flying aliens and magic lassos. I don't think he'd need to deactivate them... just have the batcomputer running a continuous program to delete any footage of him they might inadvertently shoot. Batman wouldn't even need to think about it... the batcomputer takes care of it for him. [Scott] Snyder's Batman series addressed this early on in the nu52 timeline. Batman basically hacked the entire network, and a lil' punk with blue hair caught on and is going to be his next non-Robin sidekick. Batman isn't a 'brawl in the middle of the street' kind of guy. Batman's a back alley, from the shadows, from above guy. Most, if not all, CCTV cameras point down to the street/ground. Generally they're not more than a story up in the air. 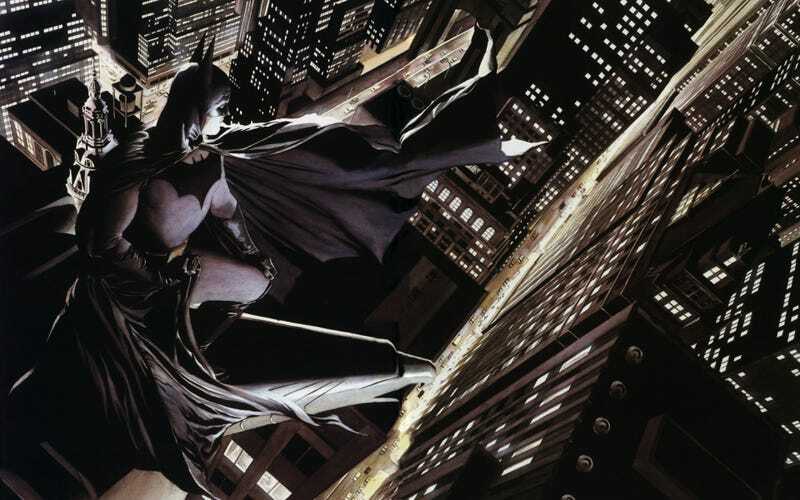 Its not out of the realm of practicality that Batman is able to avoid CCTV when CCTV generally monitors the main areas people go, not all the dark corners or back alleys. And then on top of that, people monitoring them are fallible. Places record over footage. People monitoring them aren't paying attention. They also only have limited vision angles. Its not out of the realm of things for Batman to disable the few security cameras that he might have to deal with. If anybody has a problem with Bruce Wayne evading CCTV surveillance, they better have also hated that BS sonar crap at the end of The Dark Knight. Because a Batman who can avoid being caught on camera is way cooler than a Batman who magically turns every mobile phone in Gotham into a sonar ping. Yeah, there is no "hacking" the CCTV. CC stands for closed circuit. As in, between the camera and some kind of recording instrument. No internet, no computers. He could always just break them one at a time. Yes, public property destruction probably isn't heroic, but that's assuming they aren't getting broken by the thugs and punks and gangsta kids out committing crime at night on a regular basis anyway. Lest we forget that the phrase "urban legend" doesn't necessarily mean he hasn't been caught on camera at all. "No one has ever taken his picture" could just mean that nobody has a full frame shot of him in the batsuit standing there. People might still have blurry shots, partial action shots, etc. similar to how people have "pictures" of aliens, UFOs, and bigfoot.